"It's fantastic to see the growth of the new companies building fibre and wireless networks. We're creating the right environment to stimulate industry investment, and I'm delighted by the altnets' ambitious plans to reach millions more homes and businesses over the next few years. We are also supporting these goals through government investment in new fibre networks, 5G projects and by removing business rates for new fibre deployment for 5 years. " The report also forecasts that an estimated 1.92 million premises will have the ability to order altnet fixed network high-speed broadband services by the end of 2019, with an estimated 554,700 subscribers connected. 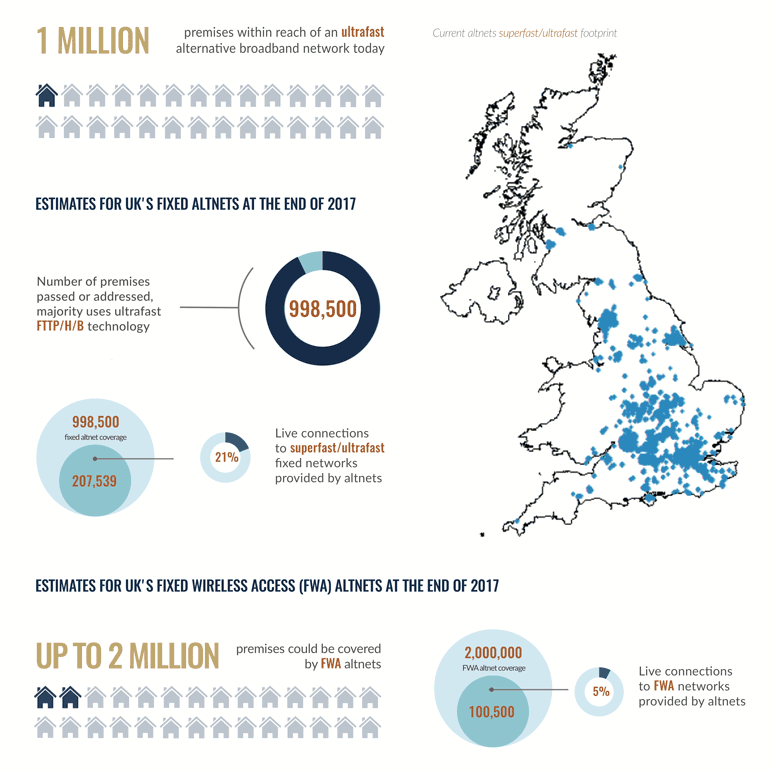 Altnets currently account for 207,500 live connections on fixed networks and an estimated 100,500 on Fixed Wireless Access infrastructure in the UK. These latest figures place altnets collectively as the third competitor in new full fibre infrastructure provision, alongside BT Openreach and Virgin Media. The altnet sector has been buoyed by announcements of more than £2.5 billion of private sector investment and a supportive public policy environment. Altnets deploy pure fibre networks (Fibre-to-the-Home (FTTH), -Premises (FTTP), or -Building (FTTB), occasionally Fibre-to-the-Cabinet (FTTC) and Docsis, fixed wireless networks, hybrid networks and satellite broadband services, operating in urban and rural areas without a copper phone network. Over the years, there has been a growing number of businesses building new digital networks to provide an alternative offering to mainstream broadband providers. For press/media queries please ocntact: Jayne Brooks, Proactive PR, +44 (0)1636 704 888.